This week, as a part of Facebook’s annual developer conference (F8), CarLabs & Kia Motors America unveiled a first-of-its-kind Augmented Reality Experience within Messenger. Kia was selected as the only automaker to participate in Facebook’s Augmented Reality for Messenger Beta program. For the first time, users of Kia’s digital assistant “Kian” can launch an AR experience in Messenger to place a Stinger vehicle in any environment. To date, the Kian digital assistant has logged over one million messages. 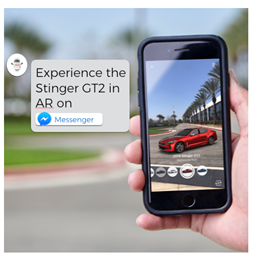 Through the addition of AR, shoppers can now place a three-dimensional rendering of the Stinger GT, in their choice of color, in their garage, driveway or other environments. Consumers can also share these images in group or one-on-one conversations within Messenger, add as images and films to their individual Stories, or save to their phones.